Located In: City of Red Wing and Wacouta Township, Goodhue County. The old bridge carrying U.S. 61 over the railroad tracks near the State Training School at Red Wing was located about 1000 feet to the northeast of the current structure. The path of the original paved highway leading to it was quite a bit different, featuring a set of very sharp curves. Very few signs of the old crossing have survived. The road at the crossing was graded in 1924 and paved with concrete, 18 feet wide in 1925. The bridge over the tracks (#3930, an 85 foot concrete girder structure) was completed in 1924. Another shorter bridge, constructed at the same time over a local creek, was located on the old road just west of the site of the current cem-stone plant. The highway between Lake City and Red Wing was reconstructed along the current alignment in 1953. However, the new bridge over the railroad tracks was not completed until 1955. In the interim, a temporary connection to the old bridge was used (see map for location). 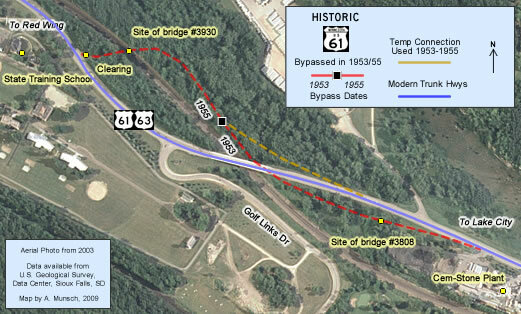 The bridges, old road, and temporary connection were all obliterated after being bypassed. 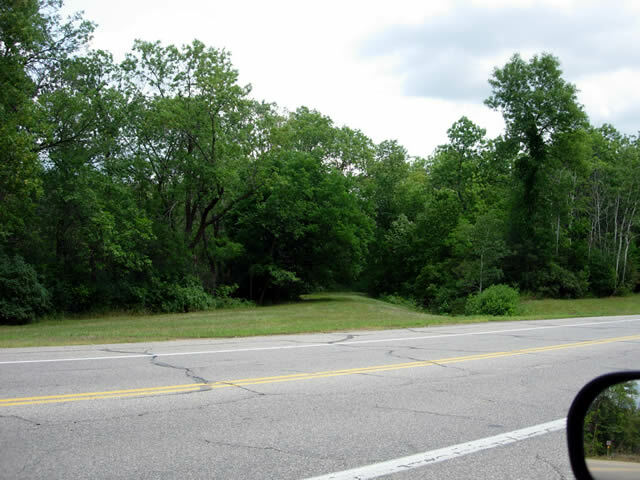 Only a clearing in the trees near the state training school marks the route to the old crossing. Looking northeast across modern U.S. 61. The grade of the old road to the rail crossing is visible in the center of the photo (photo from August, 2009).